Matilda star Christopher Sieber’s dresser Jessica Scoblick has worked on over 20 Broadway shows. She discovered a love for costume design and technology under the guidance of the Barb Wolfe, first as a theater student at Binghamton University, then as a dresser at the Cider Mill Playhouse. She moved to NYC in 1997 and went on to dress (and on some occasions, supervise) on such shows as Cabaret, Annie Get Your Gun, Aida, Dirty Rotten Scoundrels, Legally Blonde, The Drowsy Chaperone, Billy Elliot, The Mystery of Edwin Drood and more. Read on to find out about the sweetness and sass in her relationship with the man behind Miss Trunchbull. When did you first meet Christopher Sieber, and what was your first impression of him? I first met Christopher when he was in rehearsals for Matilda. My first impression of him was that he had a broken hand! My second impression was that he didn't seem fazed by that at all and was in fact still performing in Pippin across the street with a broken hand. What do you wish more people knew about dressers? Nothing! I'm not used to people knowing about us. This interview is fun, but it's weird for someone who's used to being on the other side of the curtain. What makes the two of you laugh? Sometimes he'll act as if he has a sore shoulder or something—he'll move his arm around and around in a circle, and just as I start to get concerned, he suddenly hooks his thumbs under his armpits and does Eugene Levy in Waiting For Guffman: "How HIGH a ridge I could not tell." It's so stupid, and I fall for it every single time. What are some items you both like to have on hand backstage? The usual: water/honey, Grether's Pastilles, emergency mole. What’s the most challenging part of dressing Christopher? He's extremely self-sufficient. I don't get to be the super-duper problem solver; he's always one step ahead of me. 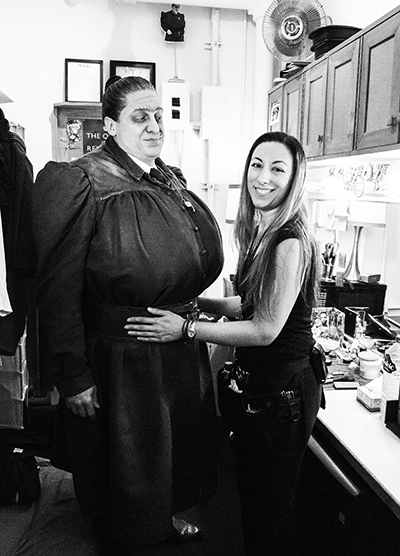 Which of Trunchbull’s costumes do you wish you had in your closet? Our styles are pretty different (she's a lot sportier than I am), but I actually really like her Phys Ed hoodie. It's enormous and soft and has all these vintage Girl Guide badges on it. What do you two bond over? I think the first time we really bonded it was over, of all things, the song "Key Largo." I can't remember why, but he started singing it, and I had it on my phone so I played it. He did a perfect Bertie Higgins voice. I sang along for the whole thing, loudly, which I do NOT do ever, especially around singers, because I have the worst singing voice known to man. But I guess I decided that I felt comfortable enough around Christopher to sing, full out, about starring in our own late late show, just like Bogie and Bacall. Now we bond over home improvement projects. His are wildly successful; mine are a disaster. I guess we don't bond over that as much as he enrages me. What's the best gift he's ever given you? I love to cook and bake. Last Christmas he and his husband Kevin (who is a chef) got me a gift card to a really great spice shop. And there have been several Williams-Sonoma gift cards as well. Probably the best gift though was four pieces of wood. I was having a meltdown because Dykes Lumber had closed and I didn't know where in the neighborhood I was going to get the wood for my kitchen shelves. He went to the Lowe's in Jersey the next day and when I got to work there were four beautiful perfect stain grade solid wood boards waiting for me in the wardrobe room. What's something he says all the time? "This is how it ends." Whether it's a leg cramp, an eye twitch, a red spot on his arm. "Is it hot in here? Is it clammy? This is how it ends. At least I'll go out doing what I love." He's a hypochondriac. What is something you do that makes him roll his eyes? Fuss too much with his (her) necktie/sock garters/Phys Ed towel. I just think Miss Trunchbull should look put together! He always says that it's lonely playing the villain—you're kind of in a different show than the rest of the cast, so you end up talking to your dresser a lot. So I guess the secret to our relationship is that he's stuck with me. Since he plays a strict instructor in the show, what is he most picky about? What makes him want to lock someone in the Chokey? He's really not picky about much. He actually likes when things get switched up; it's fun and exciting and he gets to try new things. If you want to see the inside of Chokey, come sit in the audience and then spend the entire time looking at your phone. Or better yet, record the show! Chokey for sure. Any fun anecdotes you want to share about your time working with Christopher? There's a shared fire escape between our floor and the star dressing room at the Booth next door. During the entire run of The Elephant Man, Christopher tried to get Bradley Cooper to come visit us. He would lean out of the window and yell (in a southern falsetto) "Bradley Coopah! Bradley Coopah you get in heah right now y'heah me? There's a pie coolin' on the winduhsill!" And other absurd things like that. It would make me cry from laughing it was so silly. Bradley never did come to visit. I guess it would have been a better story if he had. Oh, well. What’s the best part about being part of Team Trunch? That we get to be ourselves. We're not trying to impress each other. We do our best work for the show, but I think we can be relaxed in our relationship. Christopher sees the worst sides of me, and yet last year he gave me a birthday card that said, "To me, you are perfect."